India exists in its plurality, and yet India is also One in spirit. India is traditional, pre-modern, modern, postmodern and post-postmodern, all in one, all at one time, all co-existing, yet something more than all of these. Whether we are conscious of it or not we carry all of this diversity within us. What might be the invisible factor that transcends yet somehow binds all the multiple, outer aspects of Indian identity in such a way that each of the many outer aspects of Indian identity retains its individual status yet merges in something larger, something more whole than itself? What may be the deeper source of my connection with another Indian, or with Indian culture in general? Is there anything like the soul of an Indian? Or an Indian soul which helps people who consider themselves “Indian in heart” connect with one another despite the external differences in any or all of the outer identity aspects? These and other questions like these must be reflected upon by Indian educators so that they, in turn, can facilitate such reflection among their learners, in age-appropriate ways of course. At present, such introspection and reflection among teachers is hardly encouraged. I would even say it is never even considered a part of teacher’s learning programme – pre-service or in-service. The emphasis in teacher workshops and in-service training sessions is often on promoting the newest educational technology or the latest pedagogical approach imported from elsewhere. But why not first work with the inner technology given to all of us, the ability to look within? Imagine when a teacher discovers that perhaps this Indian-ness, this essence of being Indian lies in our shared and firm belief in something invisible beyond the visible, something supra-rational beyond the rational, something infinite beyond the finite, something eternal beyond the temporal, something that transcends yet includes All that is, was and will ever be. And that there are many different paths possible to ‘test’ this belief and ‘realize’ its truth within oneself – perhaps as many paths as there are people on the planet, including the path of questioning and disbelieving this belief itself. Such an insight would not only be deeply transformative for her own intellectual and personal growth, but it could also lead to some great discussions in classroom on discovering the truth behind the Indian principle of unity-in-diversity. Diversity concerns all that which is outer, visible; Unity concerns the invisible, the inner. It is the inner One that binds the Multiple outers. [After all, the same principle applies to who/what we are as an individual – an inner one self holds together, sustains and unites our multiple outer selves – physical, emotional and mental. Same truth holds for the collective being.] Any attempt to bring unity from the outside will lead to forced uniformity. And yet some uniformity in the outer mechanisms, structures, social policies, laws and rules might be necessary for an efficient and effective outer collective life of the society so that the true inner freedom and diversity may prevail. This fine balancing of the inner and outer, the oneness and the multiplicity needs to be brought home – first in the hearts and minds of the educators, and through their example and influence to that of the learners. Don’t we want our learners, our future generations to have a sincere intellectual awareness of and a deep commitment to this ideal that their country puts before them? Our future as a nation depends on this. The other important question in our fast globalizing world is this – How to stay Indian in spirit and at the same time healthily assimilating the influences from other cultures? This is a very real issue facing our present and future generations. Why shouldn’t our education, and our educators be constructively and creatively involved in such an important discourse of our times? If we Indians are able to get back to the true foundations of our culture, if we can imbibe deep within us the true spirit of being Indian, all the differences of the outer covering – food, clothing, religion, language, etc. will not matter. Let me also add that Indian-ness is not something that can be taught or imposed. Indian-ness is something that is gradually discovered over time. But our schools, colleges and other educational institutions can play a very big role in facilitating such a discovery process – for students and teachers alike. As we begin the process of knowing more about who we truly are in our deepest core, we begin the process of discovering what it means to be Indian. The search for the soul can lead us to the search for the soul of India. Sooner or later we are all – born in India or elsewhere – destined to be on this path of self-discovery, and until then all the outer changes and experiences we go through may just be a preparation for us. Even this phase of excessive and mindless aping of the West we are presently going through in India may have a deeper purpose behind it. There is one more question we must consider – is Indian-ness something that is limited to a particular set of geographic boundaries? If Indian-ness is a way of being, can it really be bound by boundaries or by bodies born within certain boundaries? If one feels some sort of quest to seek beyond the known and visible, to search for something invisible, something beyond the limit of human reason, and tries to make this seeking the true basis for all other seeking and progress in life, then one has chosen a certain way of being in the world. And perhaps that may be called Indian-ness. A truly Indian education will encourage and must facilitate such kind of deep reflection and introspection on what it means to be an Indian – for educators, for students, for all those entrusted with the task of educating and preparing India’s future generations. Have you read Part 1 and Part 2? 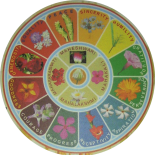 This entry was posted on February 6, 2018 by Beloo Mehra in Education, India and tagged Holistic Education, Indian Culture, Spirituality in Life.